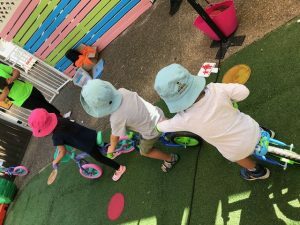 Our Road Safety Incursion is a much needed learning experience for 3-5 year old’s in preschool and long day care centres. As children from 4-5 years prepare for Kindergarten they will already have basic knowledge of road safety as this is part of their corriculum when they start school. All you need is a large enough area for set up that is flat and even ground. The children will be on balance bikes with real life size working traffic lights, stop signs and a pedestrian crossing. They all participate in being a pedestrian, a driver on the bike and the lolly pop boy or girl. As the children ride their bikes they will have to stop for the pedestrians to walk across our make shift road, and also stop and go for the traffic lights. We teach them to Stop, Look, Listen and think before they cross the road. The cost will be starting from $350 + GST depending on number of children and location.